Attractive entry-level model in anthracite/orange design. Ideal for all chainsaw users working on the ground. Fully certified chainsaw protection to Australian standards AS/NZ 4453.3.1997 Class 1. 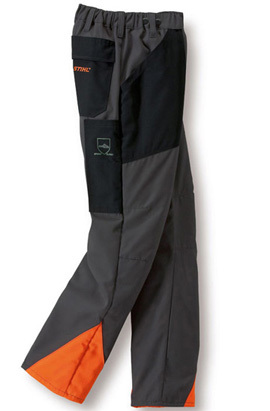 9 layers of cut resistant fabric provide enhanced protection from chain saw injuries. The fibers in the trousers are designed to rip apart if they come into contact with the moving chain and to clog the sprocket and stop the chain in certain circumstances. 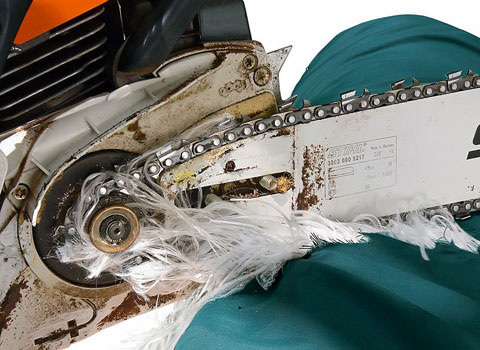 The actual degree of protection will vary with the speed of the chain at the time of contact, the power and torque of the saw, the design of the chain saw sprocket and similar factors.